The month of April is a special moment to inform the public and increase awareness regarding autism and other autism spectrum disorders. It also represents an opportunity to overcome prejudices, which are the main obstacle to the integration of those people in the community. This year, Autisme Montréal has decided to implement an awareness campaign with the theme: A Different Look. The goal of this campaign is to better inform the public at large, overcome prejudices and therefore have a different look. 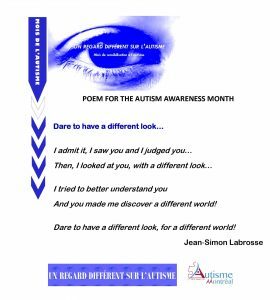 Presentation of a poem in our social media to launch the autism month: A Different Look. 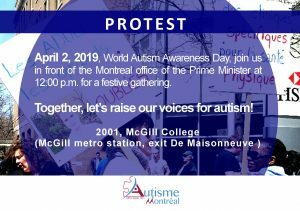 Gathering in front of the Montreal office of the Prime Minister, Mr. François Legault, to promote World Autism Awareness Day. 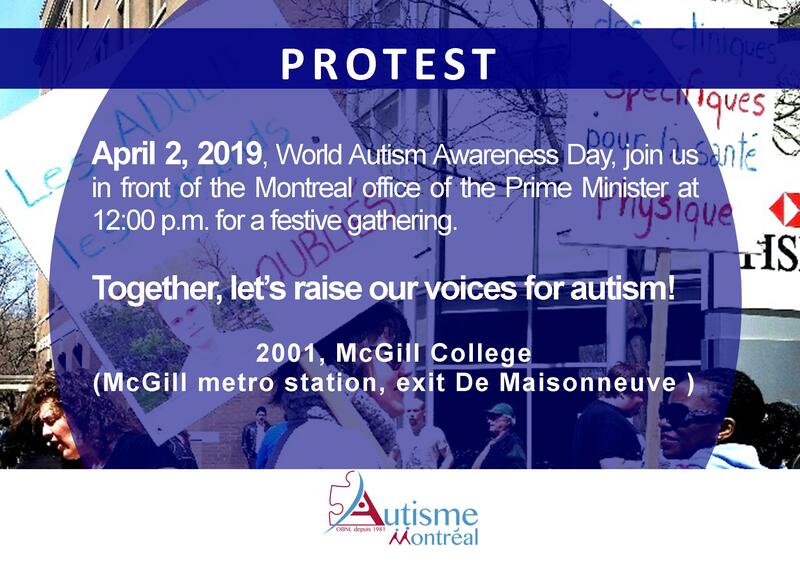 We will be expecting you at 2100, McGill College (McGill metro station, De Maisonneuve exit) from 12:00 p.m. to 1:00 p.m.
You would like your close ones and colleagues to know a little bit more about autism? 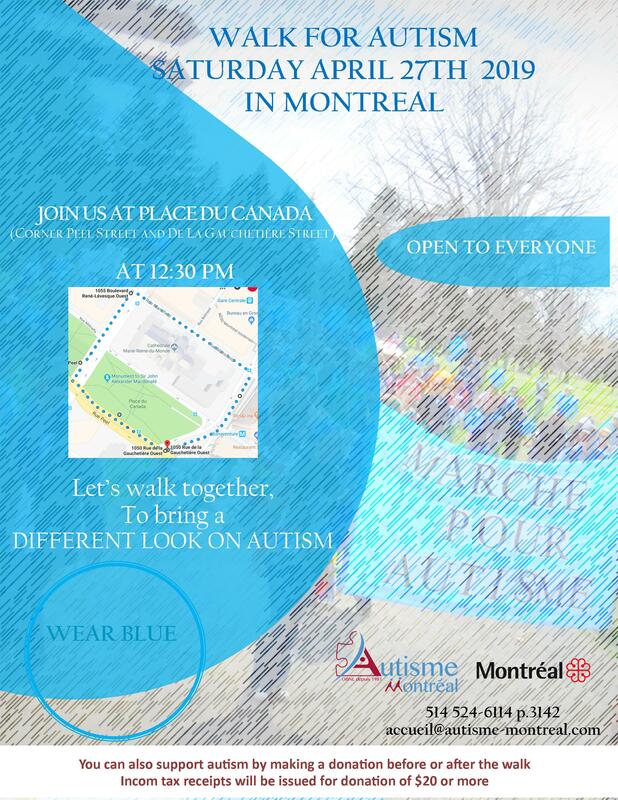 Visit our social media and share the awareness quiz of Autisme Montréal. It will be available on April 3 and that, during all the month of April. Airport Process Familiarization Day at the Montreal airport. Each participant will experience a simulated trip, starting with their arrival at the airport and up until they board an aircraft (there will be no flight). 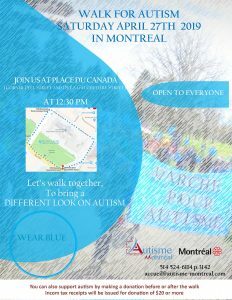 You enjoy running and you would like to take part in this run to raise funds for Autisme Montréal? Please register at the following address: http://canadarunningseries.com/bsm_caritatif/autisme-montreal/. You may also encourage the participants at the starting line next April 27-28! Autism spectrum disorder is very large. Throughout the month of April we will share different achievements of people with ASD of all ages in our social media. Read about their achievements and most of all, share them. Funny vox pop about autism will be broadcast in our social media. Have a look at them and share them.